The key with OPKs (ovulation prediction kits) other than reading the instructions carefully, is to know a line on the test doesn’t equate to a positive reading. A positive reading is generally when the test line is as dark as or darker than the control line. On top of that, a positive reading means your body is gearing up to ovulate within the next 12-48 hours. Sometimes the lines on even the best OPKs can be hard to read, so many women back them up with a digital, or skip the frustration and go with the big daddy of ovulation predictors: a fertility monitor. Internet cheapies are the best way to go for ovulation prediction kits and Wondfo makes some of the best OPKs sensitivity-wise. The tests run less than 30 cents a piece at Amazon. 50 tests will last you about 2-3 months of SMEP with some to spare. If you’re buying pregnancy tests as well, you might want to look into a combo pack of test strips. There’s no mistaking a positive on these Clearblue Digital Ovulation Tests. A smiley face in the indicator window pinpoints the 2 most likely days you are to get pregnant. These a little expensive but if you shop around on Amazon you can find them for the same price as the non-digital OPK sticks: less than $2 per test. This little Clearblue Fertility Monitor eliminates the guesswork of other ovulation prediction methods. It detects both luteinizing (LH) and estrogen (E3G) hormones to help pinpoint your exact ovulation date and its readout is crystal clear so you’ll know exactly when to start daily BD. It also saves your information for 6 cycles which is really handy for finding patterns in your cycle. If you’re just getting started with a fertility monitor, check out the Clearblue Fertility Starter Kit. 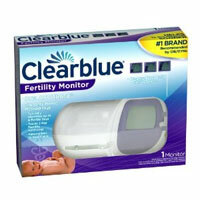 If you’ve already got one, check out the low prices on the Clearblue Fertility Monitor refills at Amazon.